LOS ANGELES (AP) The last time Utah ventured to Los Angeles, the Jazz stunned the Clippers in Game 7 of their first-round playoff series. A rematch was hardly foremost on either team’s minds when they met back at Staples Center, since both have nine new players this season. This time the Clippers came out on top, remaining unbeaten with a 102-84 victory on Tuesday. All five starters scored in double figures for the Clippers, led by Blake Griffin’s 22 points. Patrick Beverley added 19 points, but turned the ball over seven times. The Jazz (2-2) got 19 points from rookie guard Donovan Mitchell, but no one else scored more than 12. The Clippers went on a 19-2 run to seemingly take command, pushing their lead to as many as 21 points. But sparked by Mitchell and reserves, Utah cut the lead to 82-80 with 4:28 to play. ”We dug ourselves a hole, but I thought we did a good job of fighting back in the game,” said Utah coach Quin Snyder. The Clippers answered the Utah challenge, picking off three steals down the stretch and getting key baskets from throughout their lineup. ”I loved how we executed for a team that really hasn’t been in a fourth-quarter tight game,” said Clippers coach Doc Rivers. ”That was probably the most impressive thing that we did. The ball swung, moved, moved and we got shots. 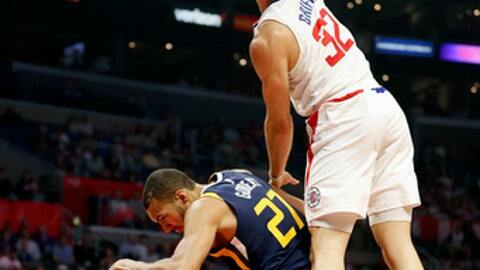 Austin Rivers added 16 points and Danilo Gallinari 14, while Jordan had 11 points and 18 rebounds. For a team that lost three starters from last season – and three of its top five scorers – the Clippers are finding ways to share the scoring load early this season. Griffin is again leading the team in scoring, but he’s getting plenty of help. The Jazz entered Tuesday shooting 49.4 in their first three games, but the Clippers held them to 43 percent shooting Tuesday. Center Rudy Gobert was shooting 66.7 percent but was only able to get off five shots Tuesday (he made them all). Jazz: Head to Phoenix on Wednesday to play the Suns. Clippers: Travel to Portland on Thursday to meet the Trail Blazers.